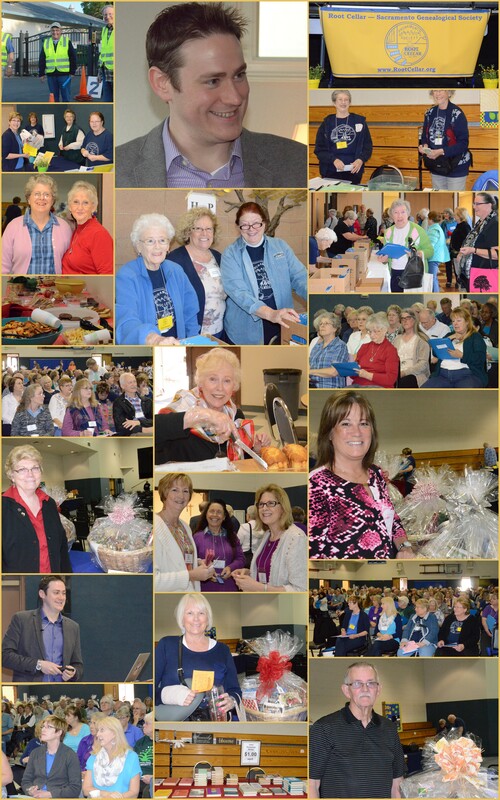 More than 250 genealogists had a wonderful day at our 2015 Spring Seminar on March 21 in Citrus Heights, CA. Parking and registration were smoothly handled by cheerful volunteers who started their day in the early morning. Interspersed with greeting old friends and meeting new, attendees perused and bought books, snacked on a banquet of treats donated by Root Cellar members, purchased raffle tickets, and studied their handout packets. And the BASKETS! -- there were 16 beautiful baskets containing various genealogy-related articles ranging from books to T-shirts and teacups. Sixteen lucky raffle winners took them home. The program for the day featured popular speaker and TV host D. Joshua Taylor. His topics covered Hidden Gems: Materials in Digital Libraries for Family History; New Tools and Ideas in Research; On and Off the Net: Locality Searching; and The Modern Genealogist: Timesaving Tips for Every Genealogist. Each presentation was filled with helpful information, search tips, anecdotes, and Josh's acknowledgments of his grandmother's mentoring since his childhood. He answered questions from the audience, and departed Sacramento for Los Angeles and then on to Australia. He's a busy man who thoroughly enjoys his career and generously sharing his knowledge with others. The success of this day was due to the detailed planning of Seminar co-chairs Diane Maltase and Denise Miller, along with help from the many volunteers who took care of each and every part of the preparations for, and the activities during, the day. Thanks go also to Holy Family Church and to Togo's.